A population dynamics model was specifically developed for assessing the marketable production of Crassostrea gigas reared in the Thau Lagoon (France) [Gangnery et al., 2001]. This model simulates oyster abundance, as a function of the growth rate and the mortality rate. We added to a population dynamics equation the inter-individual growth variability and the seeding and harvesting rates. The objective is to update the model that was previously published to make more realistic simulations and predictions. In Thau Lagoon, oyster farmers use two different rearing techniques, called "collées" and "pignes". "Collées" oysters are glued on ropes with cement, whereas "pignes" oysters are obtained from individual oysters settling naturally on empty oyster shells used as collectors and inserted in the strands of ropes (see [Gangnery et al., 2003] for a detailed description of culture methods and rearing structures used in the lagoon). 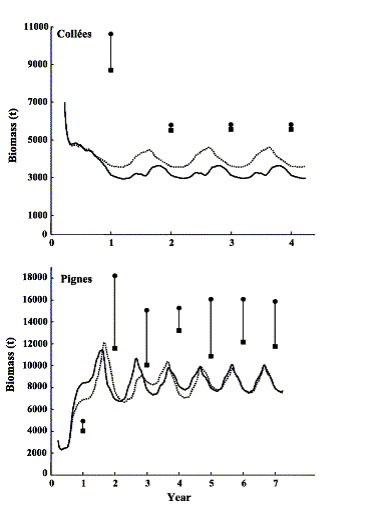 In a previous model, [Gangnery et al., 2001] focused on dynamics of "collées" oysters. "Pignes" oysters were not included in the earlier model due to incomplete information about growth and seeding and harvesting rates that were needed to estimate parameters for processes. New studies were recently conducted to improve and extend the population dynamics model to "pignes" oysters at the site; the results of these studies were used to update the previously published model. Firstly, an empirical growth model was developed for the two culture methods [Gangnery et al., 2003]. Secondly, seeding of new individuals and the harvest rate were improved for "collées" oysters and determined for "pignes" oysters through interviews of oyster farmers [Gangnery, 2003]. The updated model was calibrated on observed data sets recorded in 2000–2001 and used to evaluate variations in the whole oyster standing stock and marketable production between March 2000 and March 2001. Sensitivity analyses were carried out to identify key parameters of the model. The model was run for 2 periods of the year. 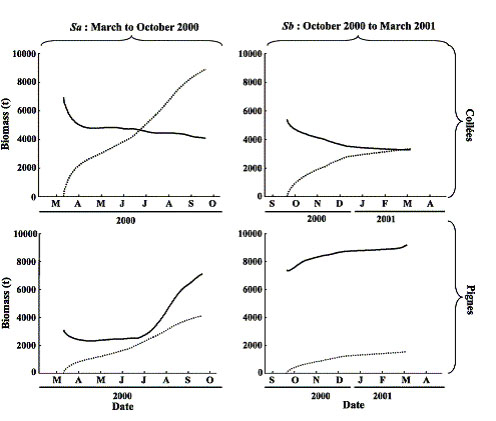 In simulation Sa, the standing stock of "collées" oysters initially decreased at a high rate; several days into the simulation, the rate of decrease slowed and appeared more regular (see Figure). For "pignes" oysters, the standing stock decreased from March (ca. 3300 t) to the end of April (ca. 2300 t) and then increased from May to October. Simulated standing stocks were assessed at 4100 and 7100 t at the end of the simulation period for "collées" and "pignes" oysters, respectively. In comparison with the observed values, the simulated standing stocks were underestimated by about 1300 and 200 t for "collées" and "pignes" oysters, respectively. The cumulative production increased to about 8900 and 4100 t in October for "collées" and "pignes" oysters, respectively. The turnover of the populations that is defined as the ratio between the number of individuals seeded per year and the mean number of individuals in the lagoon was estimated at 0.51 and 1.96 per year for "collées" and "pignes" oysters, respectively. In simulation Sb, the standing stock of "collées" oysters decreased regularly whereas the cumulative production increased to 3340 t. For "pignes" oysters, the standing stock and the cumulative production increased slightly; at the end of the simulation, the cumulative production reached 1520 t. In March 2001, simulated standing stocks were assessed at 3300 and 9200 t for "collées" and "pignes" oysters, respectively. The final standing stock of "collées" oysters was underestimated compared to the observed one (4900 t), whereas the simulated value was overestimated for "pignes" oysters (8300 t). Long-term simulations using minimum and maximum growth rate values showed that "collées" oysters had a large decrease in standing stock during the first year of the simulations (see Figure). The decrease was more pronounced when the growth rate was maximised. At the end of first year, the standing stock reached ca. 3200 and 3600 t for the maximum and minimum growth rates, respectively. During the second year, the increase in the standing stock progressed regularly and the standing stock remained at higher levels when the growth rate was minimised. The model reached equilibrium in the third year. The standing stock then varied between 3000 and 3600 t when the growth rate was maximised and 3600 and 4600 t when it was minimised. Stock values fell to a minimum level the first half of the year and rose to maximum levels during the second half. A large decrease was noticeable at the end of the year. The maximum annual production was obtained during the first year of the simulation (ca. 10,600 and 8700 t for the maximum and minimum growth rates, respectively). At equilibrium, the annual production values for the maximum and minimum growth rates were somewhat similar (ca. 5800 and 5600 t, respectively).